The universe scheduled the first torrential rain of the season (after months of drought conditions) to coincide with the day of AASCEND’s long-planned annual picnic. 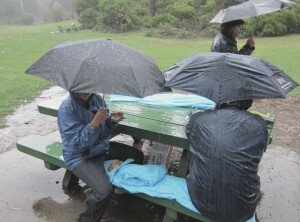 We thought we’d show up at Golden Gate Park’s Marx Meadow in the deluge, show the flag, eat some of the 6 foot sub and head home. When we arrived in the downpour, a man who had been to one of our meetings was patiently waiting for us by the assigned tables and said he needed to talk. We talked to him, put the sandwich under the plastic table cloth to keep it dry and actually enjoyed the absurdity of a picnic in the rain. None of us expected what came next: One by one, people arrived in the rain carrying their potluck contributions. Soon we had two tables filled with food and more than thirty people, including some new people who had traveled quite a distance to attend. At some point an older man rode up on a bicycle and asked for advice for a single mom (his daughter I suspect) in Santa Cruz with a newly diagnosed three-year-old. He had seen the picnic online. Eventually the rain subsided, the park sparkled and people hung out until 4:00 or so. We left with a renewed understanding of the importance of AASCEND. Enjoy the picnic photos here! P.S. Please note that AASCEND’s October 19th meeting has been canceled due to a venue conflict.